While fellow Suffragettes concentrated on Westminster, Sylvia Pankhurst headed East to form the East London branch of the Women’s Social and Political Union. Seeing the conditions that poor working women endured, she also established an infant welfare clinic, restaurant and toy factory with model working conditions. We visit places where East London Suffragettes met to protest, work and campaign travelling through Bow to Victoria Park where so many Suffragette meetings and other political rallies were held. See the newest commemoration of Sylvia and, if required, finish in a nearby pub. In among the remnants of the old City of London we find clues to the City’ Roman past. Surviving sections of the Roman Wall, the site of the Roman Basilica, the trail of the Walbrook, remains of the Roman Fort, the burial place of a Roman girl and the remnants of the Roman Amphitheatre all feature on this walk which gives you an insight to the Roman way of life, work and death. Starting on the banks of London’s lost river Fleet we learn about the palaces, monasteries and large houses that stood at the fringes of the City in Tudor times. Discover what it was like to visit the Playhouse, see the site of the King’s Wardrobe, discover the Tudor places of worship and learning, see the only statue of Henry VIII on the streets of London. As well as viewing some surviving Tudor buildings we’ll discover what life was like on the streets for ordinary Tudor Londoners. Be brave and take a walking tour of Theatreland to discover some of the capital’s haunted theatres. You’ll hear about the man in grey, the ghost of a clown and the phantom prompter to name but a few. Enjoy mysterious tales of a severed head and a ‘strangler jacket’. You’ll also discover the stories behind some well-known theatrical superstitions as we explore the streets and gaslit back alleys between Covent Garden and St James’s. You’ve seen the film “Suffragette”, now hear the story of the real women who battled for the vote. Learn about the personalities , the struggles, the misfortunes and the successes of those who paved the way for the successful women MPs of recent years as we walk the historic byways of Westminster. See the building where the “Women’s Parliaments” were held, the spot where police celebrated a suffragette leader 20 years after they arrested her, the flat of a suffragette who became a pioneering MP and the hall dedicated to the leader of the moderate wing of the Suffragettes. It’s a fascinating story full of remarkable strong willed women and their supporters. Travel back to the London of fogs and horse drawn cabs as we follow the footsteps of Sherlock Holmes and his creator Sir Arthur Conan Doyle. We will start in elegant St James’s, home to the “Diogenes Club” frequented by Mycroft Holmes and take in several locations mentioned in the novels and short stories featuring Doyle’s famous fictional detective. An embassy, hotels, historic shops, the home of the Metropolitan Police and a library all feature. We finish with a chance to view Holmes’s room at 221B Baker Street, recreated in the Sherlock Holmes Pub where we will round off our tour with a drink. This tour takes you back to London in the 1930s. A style which made its first public appearance at the 1925 Paris Exposition Internationale des Arts Decoratifs et Industriels made its way across the channel and influenced a variety of designs from radios and cutlery to places of entertainment and commerce. Starting in Victoria with some buildings dedicated to travel, we move west to the Strand with theatres, a cinema, hotels and a Masonic Temple. In addition to looking at the architecture of the period, your guide will tell stories of life in London when these buildings were erected. Please note that this is a very flexible tour . The route can be altered and can involve several areas if participants are willing to travel via public transport between different central London districts with examples of Art Deco architecture. The tour can also be combined with a look at examples of Art Deco design in the V and A’s 20th century gallery. While walking through the squares and elegant terraces of Bloomsbury we look at all types of educational establishments from elementary through to university with medical schools, an adult education institute and a teacher training college all featuring. On the way we’ll learn about how education provision moved from church to state and how ideas about education changed over the years. Surrounded by the wonderful taste and smell of bagels, the sights and sounds of the street markets and the designer stores you can really feel the memories of the Jewish community flood back with synagogues, the site of a famous maternity home and Hughes Mansions whose residents were almost entirely Jewish when tragedy struck in 1945. We see building that was home to the famous Brady Street Girls’ club and hear of the formidable Miriam Moses who ran it. View the famous London Hospital and learn of its Jewish connections and finish with some tenements and a cemetery connected with the famous Rothschild family. The 1980s was an important period for the City of of London which saw a royal wedding, deregulation and the City’s first female Lord Mayor. Princess Diana in her fairytale wedding dress ascending the steps of St Paul’s, LIFFE Traders in colourful blazers in front of the Royal Exchange and shiny new towers of commerce are all vivid images of the period. In this walk we will look at the architecture, the personalities and the events that defined the City of London in the 1980s. Come on this “magical mystery tour” of Beatles sites in London. Not only will you see some of the famous landmarks which helped map out the group’s career in the capital but you’ll explore sections of some fascinating London districts from Mayfair to Marylebone. Discover where John met Yoko, George met Patti and Paul met Linda, see the exterior of Ringo’s London flat and hear about his troublesome tenants, see an unusual venue where John was doorman for the day and view the theatre where the Beatles gained legendary status. There’s an option to extend this tour with a short tube ride to St John’s Wood to view the legendary crossing outside Abbey Road studios and Paul McCartney’s London town house (exterior only!). The Bloomsbury Set were described as people who lived in squares and loved in triangles. Stroll through the Georgian squares of Bloomsbury and Fitzrovia to see the places where the famous writers lived, worked and loved. Virginia Woolf, Lytton Strachey, George Bernard Shaw, T S Eliot, W B Yeats and Charles Dickens are just some of the writers you’ll meet on this walk. On this walk we follow in the footsteps of Jude Law, Hugh Grant, Ralph Fiennes, Gwyneth Paltrow, Rene Zelwegger and other stars of the big screen to discover some of London’s film locations.London is providing a backdrop for an increasing number of films and on this tour we visit sites where movies such as “Closer”, “Four Weddings and a Funeral” ” Bridget Jones’ Diary” and “Shakespeare in Love” have been made. Visits to film locations in the City and along the Thames will be interspersed with anecdotes about filming in the capital. We’ll also unravel the history behind some of the selected sites. Please note that this tour is available as a full day or half day tour. If you have a coach at your disposal a full day tour can include sites associated with films such as “Notting Hill” “The Elephant Man” and the recent Bond movies. Known as the Whitechapel Murderer, hear about Jack the Ripper’s brutal murders of East End prostitutes and the squalor of the poor immigrants of the day. Hear about the evidence and suspects including a royal connection. This tour explores Jewish connections in Soho and Fitzrovia. Discover an area with a rich social history which was home to Jewish Lads’ and Girls’ Club, the Westminster Jews’ Free School, synagogues and London’s most famous literary pub once run by Jewish landlords. Hear about the tailors, cabinet makers, shopkeepers, philanthropists, performers and producers connected with these vibrant London districts. Explore the connections with Jewish actors, impresarios, writers and producers. The cast includes Lionel Bart, Lord Delfont, Barbra Streisand, Harold Pinter, Oscar Deutsch and many more. Credits are also due to Lyons for the refreshments, Moss Bros for the costumes and Freed for the dance shoes. Explore the peaceful Inns of Court as we step back in time to hear the history of this secret corner of London. Famous Barristers and their unique customs, literary figures like Oliver Goldsmith, Dr Johnson and “Rumpole of the Bailey”, The Knights Templars and a Jack the Ripper suspect all feature here. We’ll view the 12th century church of the Knights Templar, visit an Elisabethan dining hall and pay a short visit to the Royal Courts of Justice. Dickens was inspired by London and spent many days and nights walking the streets. On this walk we step back in time to follow the great writer’s footsteps. Stroll through the courtyards of Lincolns Inn where Dickens set his famous novel “Bleak House”. View a 15th century dining hall and a 17th century chapel. Hear how Dickens helped with the founding of London’s first and most famous childrens’ hospital. View Dickens’ home, now a museum, and hear about his life and relationships. The oldest synagogue in England, a soup kitchen and famous Petticoat Lane are just some of the sights you’ll see on this fascinating walk. In addition to Jewish connections we’ll hear about the other immigrant communities and their contribution to the rich tapestry of the area. We return to the Naughty Nineties as Oscar Wilde mocks the twilight of the Victorian era. See the theatre’s, club and cafes where his wit triumphed. Follow the events leading to his trial and final imprisonment. Expect the unexpected in the backstreets of Mayfair and St James’s. Discover London scandal, intrigue and gossip on this walk through the streets of St James’s and Westminster and explore London’s scandalous past. Mistresses, spies, promiscuous Prime Ministers and cunning courtesans all feature, as well as private clubs, government buildings, royal palaces and elegant town houses.. The tour starts in the 18th century with Britain’s oldest surviving tidal mill. We then move forwards via, the “cathedral of sewage”, a working film studio and a waterside towpath alongside the River Lea’s tributaries to a viewing point on the edge of the Olympic site. From there we will enter the Queen Elizabeth Olympic Park where we can get up close to the Acquatic Centre , the Velodrome ,the London Stadium , the Alcelor Mittal Orbit and the attractive riverside gardens. Re-live the excitement of the 2012 Olympics, discover the history of the area pre Olympics and learn about future developments in the area. Starting with the historic shops of St James’s we move via elegant Regency shopping arcades to the tailors of Saville Row and designers of Bond Street finishing with Oxford Street’s most famous store. A shop founded by a Royal footman, a 17th century hatter, the arcade where you are not allowed to whistle, a couturier who dressed the Queen and a shopping street named after a saint to make the inhabitants behave all feature! In the oldest part of London we spend the night ghost hunting! Every alley and courtyards here holds a sinister secret. Prison cells, ghostly monks, body snatchers, unquiet spirits and an evil queen await us on this tour. Visit a place of execution and stop for a drink in a pub with a sinister secret. On this walk we go back to 1951 when the Festival of Britain took Londoners out of post war austerity to marvel at the latest innovations in art, design, industry and technology at a festival to celebrate the centenary of the Great Exhibition of 1851. Find out how this event was a catalyst for the regeneration of the entire South Bank which is today famous for its arts centre. We trace the surviving remnants of the festival including a mural by artist Topolski, two sculptures and the recently restored Royal Festival Hall. We view the post festival arts centres such as the National Theatre and finish with a great riverside panoramic view from the Oxo Tower. This tour of Mayfair looks at the area’s connections with espionage and secrecy. The hotel where Russian Security Service Officer Alexander Litvinenko was poisoned, the club premises from where spies were recruited in the early 20th century and a house where an art dealer hosted drinks parties for friends including Kim Philby, Guy Burgess, Antony Blunt and several leading members of MI5 and MI6 all feature. London’s East End is a mecca for markets and on a Sunday morning we can pack in several. This tour leads you from beautiful blooms in Columbia Road via the designer and vintage shops around Cheshire Street to a variety of goods in bustling Spitaflields market and one of London’s oldest street markets in Petticoat Lane. As well as giving you time to shop/browse Diane will tell you the history of the markets and their atmospheric surroundings. Most of these markets stay open in the afternoon and there are many so you can return to your favourites after the tour has finished. This tour of Covent Garden and the surrounding area treats you to historical vignettes and anecdotes about the West End’s most illustrious personalities. See Central London’s oldest theatre and hear about its many ghosts, view the Royal Opera House and hear about the riots which took place there. Visit a haunted stage door where an actor was brutally murdered. Discover the “Actors’ Church” and stand on the spot where Eliza Doolittle sold her flowers. See the home of a leading 18th century actor/manager. Hear about the hotel which was built from the profits of a theatre and discover a restaurant which was once the home of London’s most famous theatrical costumier. Follow the footsteps of the famous author of “The Waves” “To the Lighthouse” “Mrs Dalloway” and many other novels which changed the fact of early 20th century English literature. We’ll visit several of her London addresses in Bloomsbury’s leafy squares while learning about her life, friends, loves and literary career. For students of Mrs Dalloway there’s an option to take an alternative walk from Westminster to Mayfair visiting the sites that Clarissa Dalloway visits in the opening pages of the novel. A tour with a difference! You meet your guide in the centre of London at Charing Cross where you put her years of experience showing people round London to the test. Each person in the group gets the opportunity to direct the tour. The first group member chosen will ask the guide to walk in a direction that they select (ie walk to the top of that road, turn left, turn right, cross that bridge etc”) . The guide will take you in the direction of your choice and then stop to tell you the history of the buildings of interest in that vicinity. After the guide’s presentation the next group member is chosen to tell the guide where s/he wants to go. Only rules are that the next stop must be within short walking distance of the current location. The group has fun deciding where to go and testing their guide’s knowledge. The “Mystery” element adds to the excitement and usually results in a varied walk. A recent two hour Mystery Tour included a concert hall, a major railway station, a street market, a centre for Street Art, a bridge, a park, a hospital and the centre of Parliamentary power. Discover the area behind Euston station with a hidden burial ground, a wonderful Art Deco former factory building, a museum paying tribute to the first woman to qualify as a Doctor, a new medical research laboratory and some washing line poles designed by a famous artist. We’ll learn of local figures such as housing reformer Basil Jellicoe ,African Independence activist George Padmore, feminist writer and teacher Mary Wollstonecraft. All this plus an important location from popular TV series “Sherlock” . We don’t promise an introduction to Benedict Cumberbatch but we guarantee you’ll find the walk entertaining! This walk offers more variety than most. Starting with one of London’s best preserved Victorian stations and adjoining luxury hotels we visit a street market, a canal, the original site of the famous Lords Cricket ground, an antiques centre, an art deco factory and a once notorious street which inspired George Bernard Shaw’s most famous creation – Eliza Doolittle. This walk is a revelation with a historic site or building round every corner. Charterhouse Square with 18th century houses, an art deco gem which featured in the famous Poirot television series and medieval monastery buildings. In Smithfield Square we walk through the magnificent Victorian Meat Market to hear about its history and how it has evolved in recent years. We view the City’s oldest church which has featured in numerous films, London’s oldest hospital on its original site, a former underground railway, execution sites , a statue of our most famous king and buildings which pre date the Great Fire of London. Discover the house of a poet, a watch house, a church with a sinister secret plus the many fascinating tales surrounding the Old Bailey and the notorious Newgate Prison which formerly stood on the courthouse site. Discover some intriguing courtyards and byways of this historic area with a once notorious reputation. While some past inhabitants earned an honest living as costermongers at nearby Covent Garden market others survived by prostitution and petty crime in a district which became known as the “St Giles rookery”. An elegant 18th century church, several theatres, the home of “Monty Python”, hidden almshouses and one of London’s most famous restaurants all feature. Today’s Aldwych and Kingsway were created as continental style wide streets lined with grand office buildings, hotels, theatres and High Commissions but today’s streetscape was created fairly recently as an Edwardian redevelopment of one of London’s most notorious districts. This walk looks at the history of grand buildings such as the Waldorf Hotel and Australia House but we also go behind the facades in search of the area’s past from Saxon Village to 19th century slum and beyond. We trace the remaining streets of Clare Market, an area classed by Charles Booth in his famous Survey of London as “vicious, semi criminal”, we visit the “Old Curiosity Shop” which inspired Dickens and we’ll discover the history of the London School of Economics. See the spot where Mrs Pankhurst’s suffragettes planned their campaigns, visit the site of the Enon Chapel and hear about the “Dances of the Dead” that were held here, visit a Wren Church where writer Dr Johnson worshipped, now the church of the RAF and learn about it’s association with a famous nursery rhyme. A fascinating corner of London which has many layers of history. At first glance the Barbican might seem like a concrete jungle but there are some real hidden gems in this area. Two historic burial grounds, the centre of World Methodism, the site of an Elizabethan theatre, a thriving weekday lunchtime market which is a foodie paradise, an 18th century brewery, model social housing and one of London’s leading drama schools feature on this tour. Of course we won’t forget the famous Barbican Arts Centre, home to the best in music,film, art and international theatre. Everyone knows this busy shopping thoroughfare but behind the hustle and bustle you will find some delightful courtyards and scintillating history.Discover the street named after a Saint to improve the residents’ morals, a new hidden garden just minutes from Selfridges, the neighbouring homes of two contrasting musicians, a grand square where rival 18th century hostesses entertained, an elegant Georgian church and an antique market with a river running through it. This walk explores the hidden courtyards and alleyways of the City of London. Discover the site where the “exotic”drink of coffee was first consumed, visit deserted churchyards, admire the 17th century gates given by King William and Queen Mary to the Lord Mayor of London, drink in hidden pubs and walk through an atmospheric 19th century market place. In London’s Secret Village your guide reveals the Clerk’s Well which gave the area it’s name. We view the site of an underground prison, monastic foundations, a Jacobean Hall, a 16th gatehouse and an 18th century courthouse. Follow the footsteps of radicals such as Lenin, Marx and Wat Tyler and hear how this area has now become one of the most fashionable parts of town. This is the site that everyone is flocking to since the arrival of the Eurostar at St Pancras station. Explore the newly renovated station and unlock the secrets to the surrounding area’s history on a guided tour. Once London’s most notorious red light district this area has started to undergo a transformation. Two Victorian railway stations, the gothic splendour of the old Midland Grand Hotel, industrial buildings, regeneration projects, a German Gymnasium, film locations, a canalside walkway, literary connections and the church which gave the area its name with several notable burials. All feature on this tour culminating with a look a the newly refurbished St Pancras station. Explore the village like streets of Shepherd Market, hear about the area’s distinguished residents (Fanny Burney, Florence Nightingale, Lord Byron etc.) See London’s most haunted house and discover a small part of America in Central London. Discover the area which was once dubbed “London’s Latin Quarter” and learn how this Georgian development became the place to be for London’s literary and artistic set. Hear the stories of Fitzrovians past and present including a notorious brothel keeper, artists, writers, an explorer, a jazz musician, architects and a pioneer of birth control. See two of London’s trendiest hotels, hear the story of one of the most renowned hoaxes ever played, walk down the alleyway where a fictional photographer preyed on his victims and find out about the area’s past as a centre of the furniture trade. We finish in one of London’s most striking Victorian church interiors (subject to availability). Hangings, Horsemen and Hyde Park – Historic Bayswater. Although in the centre of London, Bayswater is one of the capital’s lesser known districts. A place of execution, the home of an ex Prime Minister, elegant squares, cobbled mews and a hidden graveyard all feature. Add to this a famous Victorian department store, an Italian Garden, a park, and several places of worship. The result = an interesting and surprising tour! Walk through the heart of what was once the centre of the nation’s newspaper industry and hear about the colourful characters who lived here. Samuel Pepys, Dr Johnson, Samuel Richardson Edgar Wallace and the colourful Sweeney Todd are all encountered on this tour. Come and explore this little known corner of London which was once the city’s Italian quarter. Italian organ grinders and ice cream sellers contributed to the area’s street life while skilled mosaic and figurine makers helped to decorate beautiful St Peter’s church. The tour will also feature a 12th century church, a road which was once part of Cambridgeshire, a courtyard with bloody connections and the streets which were settings for Dicken’s “Oliver Twist”. We explore the hidden century streets behind Westminster Abbey to see homes of famous people and numerous political figures. Discover “Queen Anne’s Footstool”, the site of a royal cockpit, monastic cloisters, delightful 18th century houses, a hotel with a secret passage and a famous public school. This walk traces the development of Regents Park from hunting ground to public park. Hear of the park’s attractions past and present – The Diorama, London Zoo, The Collosseum and the Open Air Theatre. Admire John Nash’s stucco terraces and discover a secret garden in the heart of the park. On one of our prettiest walks we discover a secret world of canals, stucco villas, a village green, attractive churches and splendid Victorian pubs. Hear about the area’s famous past inhabitants from Robert Browning and Lily Langtry to Richard Branson and Joan Collins. A winding village high street, grand 18th century houses, a famous music college and the centre of medical London are all covered on this walk. Add to this collection a fictional detective and the literary world’s best known love story and you have an entertaining tour of one of London’s lesser known districts. Although in Central London, Pimlico is a rarely explored area but a real treat. Once owned by the Duke of Westminster, this is a district of contrast with elegant private garden squares near to social housing and the site of one of London’s most notorious prisons. Today the prison has been replaced by an art gallery and one of London’s leading art colleges. See homes of past Pimlico inhabitants including a fashion designer, an artist and a Prime Minister. Discover the building christened ” A Lily among the Weeds” and learn about the film which gave this tour its title but wasn’t filmed here! A Royal Palace, some of the oldest retail businesses in London, a Wren church and several Gentlemans Clubs feature on this tour. We stroll round elegant St James’s Square to hear about its famous inhabitants. Then it’s on to Jermyn Street to hear the history of its famous shops such as Floris and Paxton and Whitfield. The Strand is one of London’s main thoroughfares but this tour looks at some of the courtyards, buildings and secret places behind this famous street. Two little known chapels, a hidden archway which inspired Dickens, a “Roman Bath”, a 17th century watergate and a “ghost station” are just some of the places we’ll visit on this tour. We’ll also walk through the elegant courtyard of Somerset House following in the footsteps of royals, sailors, artists, musicians, actors and skaters. This tour , which always surprises people who thought they knew this area, is best taken during the day when sites are more accessible. Discover Soho’s development from the fashionable 18th century through the scandalous 19th century to its present day status as the centre of London’s café and club land. Hear how Soho became a centre for international Jazz Musicians and “meet” some colourful characters including Casanova, Mozart, Karl Marx, William Blake and Jeffrey Bernard. Enjoy this walk in one of London’s most elegant and prestigious districts. Owned by the Duke of Westminster, this area inspired TV’s “Upstairs Downstairs” and has played host to numerous celebrities. Mozart, Margaret Thatcher and Noel Coward are just some of the famous residents you’ll hear about on this tour. Once the site of prisons and an area known as the “Devil’s Acre” Victoria has many secret gems. Two hidden statues of English Queens, the country’s leading Catholic Cathedral, almshouses, an exhibition hall which has served a film location, the playing fields of a famous public school, suffragette connections and the burial place of the man who tried to steal the crown jewels all feature on this walk. Discover how Scotland Yard got its name, find out why an apartment building was once famous for celebrity marriages and visit a shop which was once a school for poor children. See the Houses of Parliament, hear about the roots of democracy and famous parliamentarians. View the exterior of Westminster Abbey where coronations have taken place, walk through lovely St James’s Park to Buckingham Palace and view the homes of other members of the Royal Family. Once a secluded backwater known as “West End” this former village was so quiet that residents reported hearing the chimes of Big Ben 5 miles away but it was all change in the 1870s with the arrival of the railways followed by building of fine houses, mansion flats, shops and places of worship. On the surface today’s West Hampstead is an unassuming London district but this walk looks behind the façade to reveal stories of the musicians, actors, artists and authors who have made West Hampstead their home. Our tour features two landmarks associated with 1960s music, a cricket club, two village greens, an eccentric front garden, a surprising church interior and a burial ground containing several graves of notable London residents. At the end of the Northern Line we discover two villages – busy Chipping Barnet and delightfully tranquil Monken Hadley. The scene of the most important battle in the Wars of the Roses, Barnet has also been known as a spa, a centre of education, the scene of riotous fairs and a dwelling place for both rich and poor. Almshouses, one of London’s best local museums, beautiful green spaces, hilltop views, historic churches, a Tudor school, several inns and elegant Georgian houses all feature. At the end of the walk as you stand in a 15th century church at the heart of a village street you won’t believe you are still in Greater London. A delightful walk for the Spring and Summer, this tour takes in lovely Golders Hill Park with its children’s zoo and butterfly house, one of London’s best “secret”gardens with its pergola and part of the famous Hampstead Heath. Homes of notable people from the worlds of architecture, art, fashion and literature will feature. We finish at Whitestone Pond with nearby Hampstead Village and its numerous places for refreshment. Behind the bustle of Wood Green High Road there are architectural gems and cultural hot spots to discover. The centerpiece of this tour is Noel Park, a Victorian suburban development built to provide decent homes for artizans and labourers.. Hear about the development, social structure and architecture of the estate while exploring the avenues of houses with their glazed tiles, terracotta carvings and corner turrets. Add to this a gothic magistrates court which was once a school, a cultural quarter in a former sweet factory and a new hotel aimed at creatives in building where new and arty meets 30s style. From the Obelisk to the Angel – St Lukes, The City Road Basin and the Angel. Starting in the old Parish of St Lukes, we visit an 18th century church which is now home to a concert venue, one of London’s few remaining “slipper baths”and a famous Eye hospital. Moving towards the City Road Basin of the Regents Canal we see former industrial buildings which are now home to major architectural practices and the new developments which are putting this area on the map again. We finish in the leafy backstreets of Islington where we encounter a playwright who came to a gruesome end, a children’s author and a woman who became a heroine in Australia. Starting with a walk through Islington’s largest open space, Highbury Fields, we will admire late 18th century terraces and Victorian villas while learning of past inhabitants including eminent politicians, the founder of a famous dog show, the inventor of the telegraph and a controversial artist. Hear stories of pleasure gardens, local industries and associations with the film industry. Explore a hidden nature reserve and finish with the story of football at Arsenal stadiums past and present. This tour explores Hampstead’s lesser known but equally interesting neighbour. The name Belsize means “beautifuly situated” and its hilltop location has attracted many notable people over the years including artists and sculptors. We see the studios described as a “gentle nest of artists” where Barbara Hepworth, Henry Moore and many others worked in the 1930s. Nearby is the the iconic apartment block where Agatha Christie and her archaeologist husband rubbed shoulders with the artistic set. All this plus Victorian almshouses, delightful mews and an impressive Priory church contribute to a surprising tour of a little known area. Camden is an area that is full of contrasts from leafy crescents to “urban grunge”. Learn of this area’s development and the effect of the railways which was described graphically by ex Camden resident Charles Dickens. We’ll visit famous Camden Lock, home to one of London’s most popular weekend markets and we’ll stroll by the Regents Canal which flows past Camden’s industrial buildings and smart Victorian houses. Hear about the many famous personalities past and present who have made this area home. This is one of London’s least known areas but with much to explore. Starting with a beautiful garden square we admire Victorian villas, an unusual modern house, a stretch of canal that has recently been christened as the “Haggerston Riviera”, a park, a fringe theatre, a market and a former film studio. “Meet” the “Master of Suspense”, the “Mole Man”, a controversial zoologist and a renowned doctor on this tour of an area which can genuinely lay claim to be part of undiscovered London. Once open farmland, Hampstead Garden Suburb was the realisation of one woman’s dream. Founded by vicar’s wife and social reformer Henrietta Barnett, this now exclusive area of London had it all – village greens, meeting halls, places of worship, schools, woodland, an open air theatre, affordable homes designed by the top architects of the day – but definitely no pubs!!! Learn about this social experiment,admire the work of distinguished architects such as Lutyens and hear about past inhabitants while exploring woods, heath and “twittens”. Two theatres, one of London’s leading drama schools, wonderful Victorian houses built for wealthy businessmen and one of London’s small museums feature on this walk. Learn how this area became a safe haven for refugees escaping Nazi controlled Europe, discover artistic and musical connections. We see two sites relevant to women’s education and three sites connected with pioneers of psychoanalysis, Sigmund and Anna Freud and Melanie Klein. Made famous by the game of Monopoly, the Angel area of Islington has an interesting story. We follow part of the Drover’s trail to Smithfield taking detours to discover the London home of Lenin, some elegant squares, the terminus of the New River, a theatre famous for dance with a history going back to the 17th century, the fields which once saw rioting , the residence of the father of English clowning and a wall containing some mysterious graffiti. Once known as “merrie Islington” where you would go for fresh air and dairy produce to escape the hustle and bustle of the City, this urban suburb has fascinating history. Behind the restaurants and shops of busy Upper Street we’ll discover charming streets and squares which have been home to writers, artists and playwrights. What was once considered the “wrong side of the park” is now an exclusive part of North London. Today St John’s Wood is home to the King’s Troop Royal Horse Artillery, a delightful Regency church, Lords cricket ground, the world famous Abbey Road recording studios, elegant villas and homes of leading Victorian artists like Tissot and Alma Tadema”. Once a rural area of pasture and woods named after the “mossy well” which was once a place of pilgrimage, Muswell Hill remained rural until 1896 when developers began to build the red brick terraced houses attracting those who wanted to take advantage of this hilltop site with fabulous views. This well preserved Edwardian suburb was recently voted one of the 10 best places to live in London so come and discover the area’s charms. Starting with a well preserved Art Deco cinema, we will admire the architecture of this mostly Edwardian suburb. Learn about past residents including some giants of 60s popular music, see an historic shop that has been in business and run by the same family since the 1890s, walk along a disused railway track which is now a haven for wildlife and peaceful walks through the heart of London. We finish at Alexandra Palace with breathtaking views of Central London and beyond (weather permitting) and an introduction to the history of the palace and park. Built as a north London version of the famous Crystal Palace, “Ally Pally” has survived two fires to remain as one of London’s unsung gems containing a skating rink, palm court, great hall and hidden theatre. Discover the history of the palace and surrounding park as a venue for exhibitions, antique shows, scout jamborees, internment of prisoners, plays, concerts, ballooning, horse racing, boating and the birth of BBC television. Please note that this tour does not include an interior tour of the palace although the Phoenix Bar will be open for a post walk drink. Behind the bustling streets of Camden Town you’ll discover delightful village like streets, one of London’s least known parks, the Regents Canal and attractive Victorian terraces. See the homes of famous poets, playwrights and artists, discover why Camden was once the centre of London’s piano industry and finish at the famous Camden Lock Market. This North London district was once home to wealthy city merchants but has also attracted a number of notable personalities including religious nonconformists and some famous writers such as Daniel Defoe and Edgar Allen Poe. Learn how Poe gained inspiration while at school in the area, discover the delights of Stoke Newington’s Church Street without a chain store in site, visit Abney Park cemetery where William Booth and other Salvation Army leaders were “promoted to glory” and walk through delightful Clissold Park with its aviary,deer enclosure and traces of the New River. With buildings dating to 1615, Harrow School dominates the old hilltop village of Harrow with its magnificent buildings including a chapel, library and speech room. Hear the story of the school and its famous past pupils such as Lord Byron, Winston Churchill and Richard Brinsley Sheridan plus more recent alumni who are currently gracing our television screens! Visit atmospheric St Mary’s Church with a history dating back to 1087. See the old vicarage where a Victorian social reformer lived as a child and navigate the “dangerous corner” where London’s first road accident took place. Smaller groups can finish with tea at one of the hill’s delightful but intimate tea rooms. Starting by the Regents Canal we walk through elegant streets of Maida Vale past Victorian/Edwardian villas and Mansion blocks hearing of past inhabitants including a computer pioneer, the father figure of psychoanalysis and the first prime minister of Israel. Discover where the famous “Dr Who “ theme was first recorded, walk through the park where two champions prepared for their sporting success and view several places of worship including churches, a synagogue and a Tin Tabernacle which is now officially a ship. Just a few miles from Central London, Clapham was the destination of many 18th century city businessmen who wanted an impressive house that was a short carriage ride from their work. 19th century transport improvements attracted the “man on the Clapham Omnibus” who came to enjoy the green space of Clapham Common on his rare days of rest. On this tour we visit Clapham Old Town to hear of an old parish church, a royal laundry and an African Academy. At Holy Trinity Church we learn about the Clapham Sect and their struggle to abolish the slave trade. On the common we see the entrances to wartime shelters, discover the homes of past residents including diarist Samuel Pepys and author Graham Green. Finish at a pub which once played host to Prime Ministers and Royalty. South of Blackfriars Bridge is a world of contrasts and buildings that many Londoners and visitors to London have never encountered. Places of worship, former industrial buildings, literary connections with Dickens and Shelley, social history, a hidden cultural quarter containing two small theatres, a “ghost” station and Georgian almshouses are hidden in plain site behind one of London’s newest residential skyscrapers. Listen to the notorious Bankside stories, view Southwark Cathedral with its Shakespearean connections, see reconstructions of Francis Drake’s Golden Hinde and Shakespeare’s Globe Theatre,. Literature religion and prostitution all feature. Discover a rarely explored corner of South London which will surprise you. Behind the busy Walworth Road you will find a church designed by eminent architect Sir John Soane, a garden farm, a Victorian workhouse and a vibrant street market. Learn about famous past residents from scientists to film stars. Hear about the charismatic preacher, the housing reformer, the Pearly Kings and the Little Tramp. Finish at the area’s newly restored local museum with a chance to explore some “cabinets of curiosities” amassed by a local resident. This South London district which is extremely rich in history but rarely explored on walking tours was put on the map in 2012 when it served as a venue for Olympic shooting events. The area has a long association with the military and you’ll hear about its army and maritime connections on this walk. Henry VIII’s dockyard, an 18th century church with a famous British boxer buried in the churchyard, “art deco ” cinema buildings, a magnificent town hall, a traditional street market and the Old Royal Arsenal complex which was birthplace of a famous London football team all feature. A thriving street market, one of London’s best baroque style churches, a riverside walkway and London’s oldest railway station feature on this tour. Unravel the mystery of the playwright who may or may not have been murdered here, discover Deptford’s Russian connection, see London’s latest artists’ quarter and visit a fantastic new dance centre designed by the architects of Tate Modern. A companion to our Rotherhithe walk, this tour takes us through Southwark Park with its lake, two art galleries and walled garden commemorating local heroine Ada Salter. We view a Swedish Church and hear about the area’s past Scandinavian community. After this we head down to the river to explore the old Surrey Commercial Docks, now home to a watersports centre, new housing and an eccentric pub! Learn about the timber docks and the whaling fleets who came into the Greenland Dock. We finish with a riverside walk towards the former Victualling Yard . 18th century naval warehouses and officers’ homes remain as a reminder of this area’s maritime past. This is one of London’s least known districts with a varied history. Royal connections are strong – there was once a royal palace here which was home of Edward the “Black Prince” , the first prince to hold the title “Duke of Cornwall”. Today’s Duke of Cornwall is Prince Charles and we will see several Duchy properties on this tour. In addition to the royal connections, we will see two homes of Charlie Chaplin, music hall performer turned international silent movie star who found some of his artistic influences on the streets of Kennington. In an area of contrasts elegant late 18th century terraced houses stand cheek by jowl with social housing, a gin distillery, a famous cricket ground, an execution spot and a park where radicals once gathered to campaign for the vote. Once dominated by industry this area is now on the up with fashionable restaurants, riverside apartments and museums devoted to fashion/design. Hear about Bermondsey’s renaissance on this tour which takes in the site of an ancient abbey, one of London’s most atmospheric streets, the old Leathermarket and, if you take this tour on a Friday, an antique market. We finish in a riverside area renowned for its cuisine. Where is the amateur theatre saved by a famous American film star of the 20th century? Where is the London thoroughfare named after a children’s author? Where will you find some of London’s best preserved Art Deco interiors? In this unassuming but fascinating area of London there’s some surprising history. You’ll also find horses grazing in the fields, a church where the first Aborigine to visit London is buried, a 15thcentury Great Hall and beautiful gardens to explore. On days when Eltham Palace is open (the palace is closed on Saturdays) we will finish in the palace café and you might take the option of booking a tour of Eltham Palace (see our HISTORIC HOUSES section for description) after lunch. This unusual walking tour unlocks some secrets of Wandsworth Common. Christened “Nappy Valley” due to its popularity with well healed young families, the Victorians discovered this area’s desirability as a place to live in the late 19th century. Hear about the common’s history and discover some intriguing buildings including a gaol where many notorious prisoners have been incarcerated, a school with a 400 year old history, a splendid haunted gothic building, the home of a famous author and the residence of a Prime Minister. We end at bustling Clapham Junction with two buildings associated with entertainment and one of London’s busiest railway stations. The Royal Botanical Gardens at Kew have just been made a World Heritage site but Kew has much more to offer. We’ll learn of Kew Palace as a royal residence and discover the delights of Kew Green where those who served the palace made their homes. There’s a chance to visit St Anne’s Church where royals worshipped and famous artists were buried. All this plus fantastic riverside views. Now that the London overground “ginger line” has arrived at Denmark Hill this area is much more accessible from other parts of town so come and explore this little known district of London. Attractive Georgian houses, green spaces, remnants of a workhouse, an historic parish church, educational and medical establishments all feature. Learn about the area’s connection with the founder of the Salvation Army, the leading Victorian art critic, a famous 18th century writer and the only living British actress to be awarded a blue plaque. We finish at the South London Art Gallery where we find an excellent cafe and , depending on the tour timing, interesting exhibitions of contemporary art. In this unusual walk we explore the area on the south side of Tower Bridge. Two “lost churches”, atmospheric cobbled streets, London’s newest theatre, two new hotels in historic buildings, a statue of one of London’s most commemorated but least known politicians, fabulous river views and Victorian warehouses all feature . Come and hear tales of rags and riches, industry past and present, actors , sailors, felons and firemen. This little known South London suburb has suddenly become much more accessible thanks to the new East London Overground extension. On our exploration we’ll discover a lost canal, artists studios, a pub in a magnificent 20s cinema, a folly and a hilltop museum containing some eccentric collections. While visiting these sites we’ll hear about some notable inhabitants of the area including a brave clergyman and several wealthy businessmen who came for the location and the fabulous views which we’ll enjoy if the day is clear. Not far from Central London, Lambeth is rich in history and offers some surprises. The Imperial War Museum, Lambeth Palace and the Museum of Garden History rub shoulders with elegant squares, a Catholic cathedral, the remains of the Royal Doulton factory and the best riverside views of the Palace of Westminster. We’ll also “meet” notable ex residents such as William Blake and Captain Bligh of the Bounty. This old riverside village was much altered by the development of the Docks but still has many stories to tell. Connections with the Pilgrim Fathers, an unusual film studio, 19th century warehouses, breathtaking river views, contemporary sculpture, an 18th century church and a community centre with a sinister secret all feature on this tour of one of London’s lesser known districts. This vibrant area of London will surprise you – it’s not what you’re expecting! An elegant Edwardian Baroque Town Hall, one of London’s oldest cinemas, georgian almshouses and a windmill all feature from the area’s past. There’s one of London’s liveliest markets selling an amazing variety of goods from wigs to fish and religious artefacts! Learn about the area’s past as a centre for music hall artistes and its recent regeneration as a centre for entertainment. Discover the history of London’s African Caribbean community and some of that community’s leading “movers and shakers”. It’s all happening in Brixton! Walk through beautiful Battersea Park with its lake, Children’s Zoo, Festival Gardens and Peace Pagoda. Leaving the park we follow a riverside walkway to learn about the area’s bridges, past industries and recent regeneration. View new buildings designed by Britain’s two most famous contemporary architects, view the elegant 17th century house which has played host to a Hollywood star and finish with a visit to St Mary’s Church which has connections with two famous artists. Discover one of London’s lesser known areas which is rich in history and full of surprises. A famous cricket ground created on land owned by the Prince of Wales, a City farm which stands on the site of London’s most popular 18th century pleasure garden, a home of modern burlesque, a secret square and the capital’s smallest houses all feature. We’ll view one of London’s best Victorian churches and take the riverside walkway to see London’s worst kept secret – the MI6 building which features in al the recent Bond movies. Nowhere in London will you find such areas of contrast than in Peckham. From bustling Rye Lane with its African grocery stores through Peckham Square with its award winning library and on to the Bellenden Road renewal area with its independent shops and artistic street furniture we uncover the story of this surprising part of London. Elegant 19th century villas, places of worship, a green where the geese once took rest, the common where William Blake saw his first visions and one of the most neighbourly streets in London famous for its floral displays all feature. This is a delightful area of London that is given very little coverage but you’ll wonder why you’ve never visited as you cross the river via a railway bridge affording fabulous views. Two parks, a common, a brook, the sweeping expanse of the Thames, attractive Victorian houses with gardens stretching down to the river and good pubs will greet you. We’ll visit the historic church which hosted the Putney Debates during the English Civil War, view one of London’s most unusual galleries, discover a relic of World War II, stand on the site where the famous annual Oxford v Cambridge Boat Race starts and promenade past the numerous boathouses belonging to long established Thames rowing clubs and famous English public schools. Discover a second little known waterway, the home of a character in children’s fiction and blue plaques commemorating writers, politicians and a ventriloquist. There’s something for everyone on this tour. Wandsworth’s history has been shaped by its position on the River Thames and the lesser known river Wandle. The Wandle provided power for mills which were used for flour milling, copper working, gunpowder making and oil pressing. It’s clean water was used for brewing and calico printing. The famous Ram brewery produced beer in the centre of Wandsworth from 1576 until 2006. Hear about the first railway in the world, the riotous “Mayor of Garratt Election” and the Huguenot Refugees who contributed to the area’s industrial success. We’ll visit the green space of Wandsworth Common and and follow the Wandle to the Thames where we’ll see the contrast between old industrial Wandsworth and the area’s new luxury riverside apartments. In the centre of Wandsworth we’ll view the remaining buildings of Young’s Ram Brewery and learn of plans for their future. Many people are now familiar with the sites of Bankside but this walk delves into another side of Southwark away from the tourist trail. Two small art galleries, a former chocolate factory that has recently been given a new lease of life, a delightful garden created by a Victorian philanthropist, two secluded Georgian squares, the wall of the prison where Charles Dickens’ father was incarcerated for debt and “Little Dorrit’s Church” all feature. Hear about a murderous married couple, a flamboyant firechief and a local heroine while we wind our way round the lesser known corners of this intriguing district. Travel back to the days when Streatham High Road was the West End of South London. Streatham had it all- fashionable shops , smart Art Deco Apartments, cinemas aplenty, a popular dance hall, the famous Streatham Ice Rink and a theatre which attracted the top performers from Shakespearean actors to the leading variety performers. In addition, we’ll discover Victorian social housing, a village church with an interesting history, the home of London’s most famous “madam” and two commons. Transferred here from Hyde Park where it played host to the Great Exhibition of 1851, the Crystal Palace transformed this part of Sydenham to one of London’s great attractions. Sadly the palace was destroyed by fire in 1936 but its legacy is a fine park with an intriguing history. Your guide will tell the story of the Crystal Palace Exhibition while we trace its remnants including statues of sphinxes and dinosaurs. Solve the puzzle of the tea maze, walk by the lake, visit the small museum (available at weekends only) and learn of some of the fabulous events which took place here. Discover a world of elegant Victorian villas and garden squares on this foray into one of London’s lesser known districts. Unlock the secret of the strange circular structure near the tube station and find out why the James Bond logo is painted on the exterior. Uncover the identity of the real life spy who is honoured here and see the building which was the subject of a lecture at the Royal Academy by local author Will Self. All this plus renowned artists, a mysterious museum, London’s “little Portugal”, an eccentric theatre manager and two respected 17th century gardeners. A short train journey from Central London’s Waterloo station takes you to delightful Kingston which has everything from a great shopping centre to a medieval market place. Tradition has 7 Saxon kings being crowned here and you can see the ancient coronation stone which was used for these ceremonies. An historic church, a 19th century market hall, one of the oldest bridges in London and one of the most elaborate shop fronts you’ll ever see contrast with newer buildings such as the Rose Theatre which is gaining a reputation for excellent productions. Learn about past inhabitants including a Bishop and a famous pioneer of moving pictures. Along the riverside you’ll hear about the area’s more industrial past and take a pleasant walk where industry has now been replaced with waterside restaurants and pubs. Visit an area which inspired two classic British films and discover its history. Admire the town hall which is now one of London’s leading Arts Centres and hear about its radical past, learn the history of one of the country’s busiest transport hubs and walk through streets of houses built for Victorian artisans. We visit the western side of Clapham Common, view a pub where drink was not allowed and finish in trendy Northcote Road, the High Street of the area christened “Nappy Valley” by the press! There’s more to Wimbledon than tennis and the Wombles. Explore this lively hilltop village with its many cafes, pubs and boutiques. Visit historic St Mary’s church and discover the tomb of the man who made London a more fragrant city. Admire the historic houses around Wimbledon Common and learn of some eccentric past residents. Just a few streets from Waterloo Station you’ll discover Georgian workers housing, a famous theatre which oversaw the birth of many of our national companies, the “station of the dead”, a street market which has just been given a new lease of life, independent shops, a riverside walkway and land which once belonged to the Prince of Wales. Until recently a forgotten industrial backwater, this area is enjoying a new lease of life with artists studio, a fringe theatre and a number of new developments. A riverside walkway and a renovated green trail contrast with old industrial buildings converted to artists live/work spaces and bars/restaurants. Learn the history of the area’s industrial past with employers like Trebor, Clarnico who made the renowned mint creams and Percy Daltons, famous for their peanuts. Today Hackney Wick is home to Forman’s Smoked Salmon. We will also discover Hackney Wick’s sporting connections with the Eton Mission Rowing Club and proximity to the 2012 London Olympic Stadium. A Ragged school, hidden cemeteries, the “People’s Palace”, a charity that cared for thousands of children, an ancient church, one of London’s oldest inner city farms, an 19th century synagogue building, a canal and some elegant 18th century houses all feature on one of Diane’s most surprising tours. Discover theatrical history of past music halls and radical history with an anarchist club and the fields where people assembled to challenge the system. Stepney is a hidden green oasis just a few minutes away from the busy Mile End Road. Dalston has recently taken over from Shoreditch as the area that up and coming arty types head to. On this walk we start with Dalston’s regeneration by way of a leading fringe theatre, improved transport links and a brand new green space. We then move back in time to Victorian Dalston by way of old industrial buildings, gothic revival churches, a famous music hall artiste, a hospital admired by Florence Nightingale and the square which provided inspiration to the creators of a soap opera. We explore cosmopolitan Dalston via the famous Ridley Road Market with its Turkish and Carribean flavours before heading northwards towards Newington Green where we discover London’s oldest terraced housing and a chapel which attracted those who wanted to change the world. Starting with the gleaming towers of Canary Wharf we go back in time to see the Georgian dockside warehouses of the old West India Dock. Discover why the dockside area was once known as “Blood Alley”, learn about the hard life of the Dockworkers and the notorious “call ons”. We then move even further back in time to the 18th century to visit Limehouse, an old riverside “hamlet” which played host to sailors, ropemakers, a pottery and those who made money fishing bodies out of the Thames. Learn how this area became home to London’s Chinese community who captured the imaginaation of authors such as Oscar Wilde, Sir Arthur Conan Doyle and Sax Rohmer, creator of Fu Man Chu.. View an 18th c church, walk down Narrow Street where Dickens set scenes for “Our Mutual Friend” and maybe have a drink in the pub. Discover a corner of the East End that most walking tours miss. The Commercial Road was created in 1802 to facilitate movement of goods from the Docks to the City. Starting with a street market we go in search of the illusive “Peter the Painter” as we visit the site of the Siege of Sidney Street. We see one of the East End’s few synagogues still in operation, an art deco cinema where a famous opera singer trained and three of London’s lesser known garden squares. We’ll visit the pub where the Queen Mother once pulled a pint and where Sir Ian McKellen recently gave an impromptu performance at one of London’s strangest ceremonies. Then leaving the bustle of the Commercial Road we’ll finish with the tranquility of a marina, a canal and a yurt where there is refreshment and meditation on offer. Now that the London Overground has reached Haggerston an area unknown to many Londoners has become more accessible. On this walk we discover several green spaces, a City Farm, the park where Michael Jackson landed his helicopter while visiting a local hospital, an organ manufacturers, a canal and beautifully preserved Victorian housing. Homerton has seen plenty of changes over the years . This area was once home to wealthy and influential men seeking a retreat not far from the City but surrounded by pasture and farm land. By the 19th century industry and the railways bought great change and Homerton became a working class area but inhabitants could still enjoy the rural aspect of the Hackney Marshes and the River Lea. Now the industry has vanished and with less pollution the area is ripe for regeneration. On this walk we follow Homerton’s fortunes through the ages discovering great contrasts between 20th century housing developments, Victorian terraces, green spaces, narrow boats along the Lea , places of worship , a street market and arts projects. Finish with a drink in the bar of a recently reopened 1913 cinema. Once home to the East India Dock and the wealthy East India Company Merchants, Poplar has had its ups and downs over the years. On the brink of a renaissance with lots of new building and “regeneration” a buzzword, let us discover an area rich in history and with some significant landmarks. We explore the area of the old East India Dock, visit a location which inspired the fictional “Nonnatus House” in “Call the Midwife”, walk through the housing estate which was an exhibit at the 1951 Festival of Britain and view the Balfron Tower designed by renowned modernist architect Erno Goldfinger. Going back in time, we will see several sailors hostels and hear of the brave rebel councillors who went to prison for what they believed in. See the home of a a famous 18th century champion boxer, take a peek at a treasure trove of children’s toys, admire the old town hall which is now a luxury hotel and walk down a street of delightful Victorian houses en route to attractive Victoria Park. London’s first “peoples’ park.” As we stroll through the park with its lake and canal you’ll hear how it has hosted protests, rock concerts, boating and leisure pursuits. We will view the ornate drinking fountain financed by Angela Burdett Coutts, the second richest woman in Victorian England and will learn how she amassed her great fortune. In 2012 this area of East London took centre stage for the Olympics. Discover Stratford East , hear about recent regeneration and learn about the area’s history. An impressive town hall, two Victorian theatres, an area which was once a trainspotter’s paradise and a new cultural quarter all feature. Hear about the area’s past movers and shakers including the first Labour MP, a maverick theatre director, a poet and and a philantropist. This walk is full of surprises – an 18th century tidal mill, film studios, artists’ studios, a “cathedral to sewage” and a delightful medieval church all vie for attention. A number of interesting characters passed through Bow including Queen Matilda who nearly fell in the River Lea, Chaucer’s fictional Prioress, Indian political leader Ghandi, social reformer Annie Besant and suffragette Sylvia Pankhurst. Learn about the struggles of the matchgirls, the battles for female suffrage and the campaign for a fair rate by radical local councillors. 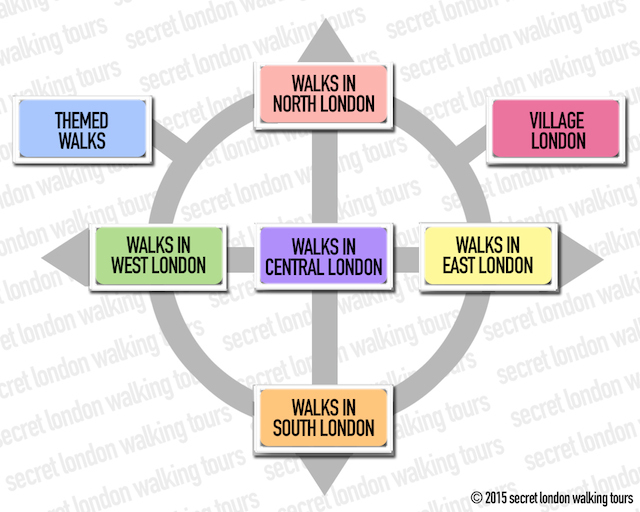 This walk is a “must” for anyone interested in London’s social history. On this walk we explore Whitechapel and Mile End to hear about East End gangsters, reformers and radicals. Jack the Ripper, The Krays, The Elephant Man and Dr Barnardo all feature on this tour. Trace the history of this fascinating area of Thames waterfront. Discover its sinister past from Execution Dock to the opium dens of Limehouse. Enjoy spectacular riverside views, walk down cobbled streets lined with 19th century warehouses converted into exclusive apartments and hear about the time when these streets were bustling with activity during the heydays of the Docks. Discover one of London’s most fascinating and vibrant areas. A dramatic 18th century church, two market buildings, an old brewery and the best preserved early Georgian domestic architecture in London feature on this walk. Walk down the atmospheric streets which have featured in so many tv adaptations of classic British novels like “Nicholas Nickleby”. Learn about the many immigrant communities including French Huguenots, Russian and Polish Jews and Bengalis who have added to the rich tapestry of the area. Discover how this area has developed into a popular enclave for successful East London based artists and designers. Have you ever wondered about the origins of this mysterious name and why inhabitants of this area call themselves Islanders? Why is there a station called Mudchute? Why does Millwall Football Club no longer play in Millwall? Find out the answer to all these questions and more on this tour of a rarely explored corner of Docklands. 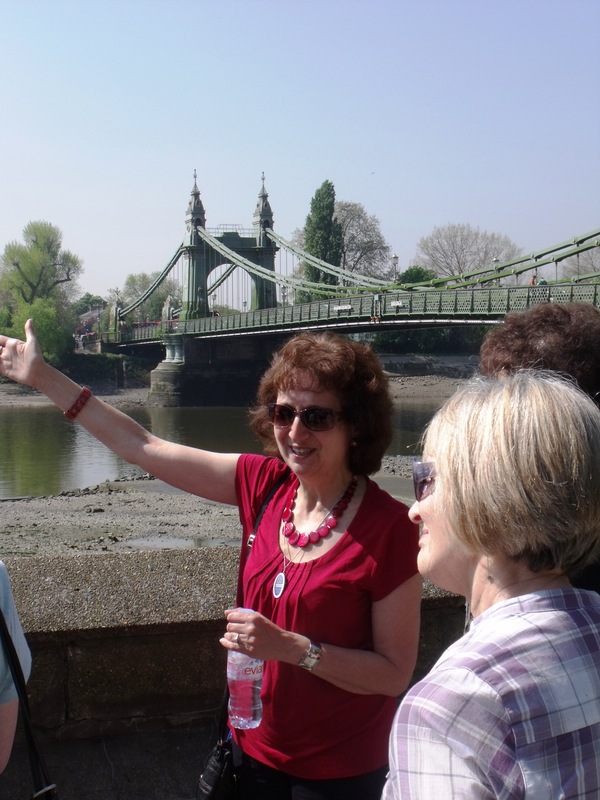 A City Farm, a Bond movie location, “homes for heroes”, the site from where a famous ship was launched, riverside and dockside walkways and one of the best views in London feature on this tour. Now that the East London line has reopened Shadwell is back on the map again and this walk will unlock the secrets of an area rich in history. Delightful St Katherines Dock, a square with Scandinavian connections, London’s oldest music hall still in use as a theatre, an heroic female doctor, the notorious Ratcliffe Highway murders and the site of the famous Battle of Cable Street (Oswald Mosley’s blackshirts versus the Jews and Dockworkers of the East End) all feature. We’ll also see a school which inspired a 1960s film, the place where our money used to be made, remains of a medieval abbey and a traditional street market. Follow the Market Porters’ Route from the old village of Hackney with its ancient church tower through London Fields to Broadway Market with its canalside location and unusual specialist shops (plus, on Saturdays only, a great food and vintage clothes market!). The walk includes the famous Hackney Empire where Marie Lloyd and other famous music hall artistes once entertained , the 16th century Sutton House, an 18th century church and the Victorian Round Chapel. Hear about the area’s past when rich City merchants settled in this once elegant district, 19th century industrialisation, 20th century immigration and recent regeneration projects. Trace Shoreditch’s history from the days when it was London’s Theatreland (Shakespeare in Love was partly set in Shoreditch! ) to its current status as a centre for artistic creativity. England’s leading circus centre, a Victorian music hall, and a traditional street market all feature on this walk, which finishes at the Geffrye Museum, London’s museum of domestic interiors. Passing Hammersmith by road or rail people often don’t realise that the River Thames flows through this area which holds some delightful secrets. Theatres, film locations, an elegant square, two churches, an exclusive school with some famous ex pupils and, of course, a riverside walkway with great views all feature. Hear of some actors, writers and artists past and present who have made Hammersmith their home. Learn the history of the famous Oxford v Cambridge boatrace while passing the many sailing clubs which line this part of the river. Discover a bridge which is a great survivor and find out why some Hamersmith residents should have avoided the funeral of one of England’s most popular royals. See Holland Park’s beautiful gardens and the remains of a Jacobean mansion. We move on to the Melbury Road Artists Quarter to admire the magnificent houses of Luke Fildes and William Holman Hunt. After an interior visit to Lord Leighton’s House we explore the delightful streets of Kensington, finishing at St Mary Abbots Church with the highest spire in London. In 1875 cloth merchant turned property developer Jonathan Carr purchased 24 acres of land in Chiswick to create a enclave of well designed houses to attract like minded people who were interested in the arts, culture and aesthetics. Top architects including Edward Godwin and Richard Norman Shaw were employed to build distinctive red brick houses which attracted the likes of poet W B Yeats, playwright Arthur Wing Pinero, actor William Terris and numerous Victorian artists. An art school and social club facilitated self improvement and a rich social life which made this area unique for its time and was much imitated by the founders of later Garden Suburbs. We take a walk through the area’s elegant streets to view the distinctive architecture, a church, the club house and a pub decorated with tiles by artist William De Morgan. The tour will be enlivened by tales of the area’s sometimes eccentric inhabitants and their activities. We’ll hear about Bedford Park’s growth, decline and late 20th century renaissance as one of London’s most sought after districts. Discover how this area of Central Kensington was transformed from a country village just outside London to an elegant area where royals made their home turning a grand house into a palace. However, not far away was a more humble quarter where the workers who served the grandees lived. An elegant square, luxurious department stores, a former workhouse, delightful cobbled mews and some of the most expensive houses in London are cheek by jowl. We will also hear of some of the fascinating personalities who lived here including a courtesan, poets, artists, a philosopher, actresses and writers. Starting at Kensal Green we hear about London’s earliest large out of town cemetery, we move on to a well preserved Victorian workers’ housing estate, the canal basin which is now a hub for design and dining, a delightful small park which is the starting point for the famous Notting Hill carnival and one of London’s most cosmopolitan shopping streets where you can sample Portuguese or Moroccan cuisine after the tour. This rarely explored London district is fascinating for all those interested in London’s rich social history. Please note that this walk stops by but does not include a tour of the Kensal Green cemetery which can be arranged separately with the Friends of Kensal Green. This West London suburb was once home to successive Bishops of London. The last Bishop left in 1973 and his home is now open to visitors, surrounded by a riverside park. On this tour we walk through the park and view the palace with its 17th century herb garden. We pass Victorian almshouses, a pottery kiln and the home of London’s oldest football club. If available, we visit two churches with some fascinating connections. Learn about the lifestyle of the bishops, an anti slavery campaigner and a crucial event in the English Civil War. Once known as “Pope’s Corner”, this little known area of Hammersmith has been home to many famous residents including the leading actor of the 19th century and an author who ended up in prison. We’ll discover past industries, schools with famous alumni, the building where the D Day invasion was planned and the building where our major museums store their hidden treasures. Finish at a Victorian exhibition hall which has played host to circuses, military tournaments and antique fairs. Starting at busy Fulham Broadway with the home of Chelsea football club we head down towards the Thames. On the way we admire Victorian college buildings, artists studios, a fine art college, a power station, workers cottages, luxury apartments and London’s oldest gasholders. Mix this with breathtaking river views, a harbour, new gardens and a heliport resulting in an exploration of an area well away from the tourist trail. A few steps away from the bustling Kings Road, you’ll find a tranquil riverside village. Viw the famous Royal Hospital, home of the Chelsea Pensioners, discover a hidden garden from where the first cotton plants were sent to the Americas, see the site of Thomas More’s mansion and visit the historic Chelsea Old Church. We start with the notorious “acid bath murderer” before entering an enclave of exclusive Victorian London which has been home to varied personalities including Princess Diana, Hugh Grant, Beatrix Potter and W S Gilbert. In Brompton Cemetery we seek out graves of the famous including suffragette leader Emmeline Pankhurst. Nearby is Earls Court exhibition centre which has been home to Wild West shows, the royal tournament and rock stars. We finish in cosmopolitan Earls Court with its elegant squares, lively atmosphere and village like early 19th century housing hidden away from the bustle of Earls Court Road. Trace the history of this area from its notorious days as the home of piggeries and potteries to its current status as a fashionable media haunt. We visit film locations from the famous “Notting Hill” movie, window shop in Portobello’s antique shops and discover squares with luxuriant hidden gardens. We dig deep into the history of an area which most people pass through travelling west out of London. This area is a revelation. Early 20th century places of entertainment, a market with 100 years of history on the verge of a makeover, the site of a film studio and home for “fallen women” financed by one of the richest women in Victorian England, a Japanese Garden from the famous “White City” exhibition centre and the iconic Television Centre which is currently under transformation. We end at the “finishing line” of the 1908 Olympic Games. Best known as the home of English Rugby, Twickenham has many hidden treasures. The eccentricities of Eel Pie Island with its rock history, a lovely riverside promenade, a 17th century town hall with wood panelled rooms which was once a private house, homes of French aristocrats, historic pubs and an old village street all feature on this tour of one of London’s lesser known suburbs. Discover the delights and hidden corners of Knightsbridge. Starting with the area’s most famous attraction – Harrods – we learn how the store started with a small grocery business back in the 1840s. From there, we explore the backstreets, mews and squares of Knightsbridge to hear tales of actresses, mistresses, a bigamous Duchess and a society scandal. Discover an area which was developed after the Great Exhibition of 1851. Find out where Eliza Doolittle sold flowers when she wasn’t in Covent Garden, discover some of London’s most elegant Victorian streets. South Kensington has it all from grand museums to hidden mews and we see the area’s contrasting faces from the large scale to the intimate in this unusual walk. Ealing is one of London’s greenest suburbs with a common, a green and several pleasant parks. On this tour we discover two Victorian churches, an elegant 18th century manor house designed by renowned architect Sir John Soane and a film studio where many famous British movies from 40s classics like “The Ladykillers” to 90s hits like “Notting Hill” have been filmed. Hear about past Ealing personalities from a Prime Minister who was assasinated, two renowned tennis players, several rock stars and the widow of a poet who scandalised 19th century society. With buildings dating to 1615, Harrow School dominates the old hilltop village of Harrow with its magnificent buildings including a chapel, library and speech room. Hear the story of the school and its famous past pupils such as Lord Byron, Winston Churchill and Richard Brinsley Sheridan plus more recent alumni who are currently gracing our television screens! Visit atmospheric St Mary’s Church with a history dating back to 1087. See the old vicarage where a Victorian social reformer lived as a child and navigate the “dangerous corner” where London’s first road accident took place. Smaller groups can finish with tea at one of the hill’s delightful but intimate tea room. Fancy a day out of London without leaving the capital? Then Barnes is the place for you! From the moment you step off the train you’ll be charmed by this lesser known London district with stunning riverside walkways. There’s no embankment to separate you from the river so you can walk along the river path watching rowers from famous London rowing clubs being put through their paces along the route of the famous Oxford v Cambridge boat race. Along the terrace we’ll see homes of a famous composer and the founder of the Royal Ballet. Discover a hidden lake and a brook that meanders through a common, see Barnes’ oldest house dating to Tudor times where Elizabeth I’s Sypmaster General visited his deputy and visit the building where Queen’s “Bohemian Rhapsody” was recorded. Many people visit historic Greenwich but very few venture to its more attractive but lesser known neighbour. Blackheath really does deserve the title of “village” with its unique shops and delightful houses. Hear of the historic gatherings on the Heath, the first game of golf in England, the secret caves and a Queen who fell out of favour. We’ll see historic 17th century almshouses, a pagoda and an elegant 18th century crescent where two ladies scandalised Blackheath’s polite society. One of London’s riverside villages, Chiswick has much to offer. We’ll view the home of a famous 18th century artist, a delightful village church, a Palladian mansion , two breweries and the house which inspired Thackeray to write “Vanity Fair”. There’s also a chance to discover London’s first Garden Suburb. Explore a delightful south London village. Hear how an actor’s guilty conscience led to the foundation of almshouses and a famous school for boys. View the art gallery which is also a mausoleum, see London’s only remaining tollhouse, walk through two delightul parks and finish in a real London village street. Explore this historic North London Village and hear about some interesting inhabitants past and present. Stroll through Waterlow Park and view Lauderdale House where Charles II is reputed to have left Nell Gwynn. Afternoons end with optional visit to an historic pub. One of London’s most picturesque and historic spots is explored on this tour. After coming to take the waters for their health people stayed and made this former farmland area into an elegant village just over 4 miles from central London. Many who came to improve their health were creative and we’ll see homes of the famous including artists and writers. We visit an 18th century church with some notable burials, the highest point in London, a house which inspired the author of a well loved children’s story and finish at Hampstead’s small museum situated in a Queen Anne era house. On this walk we visit historic St Alfeges Church and hear about its connections with General Wolf, Henry VIII and Thomas Tallis. We walk through the 19th century Greenwich Market to the park where we view the Royal Observatory, National Maritime Museum and the Queen’s House. The walk finishes with a delightful riverside walk to see the Cutty Sark, Gypsy Moth, two historic pubs and the magnificent Royal Naval College. Just a few minutes from busy Walthamstow Town Centre we enter a different world of one of London’s villages. An ancient church, an 18th century workhouse now housing a museum, two sets of almshouses and a 15th century half timbered Tudor house are some of the bulidings we’ll explore in the old village centre. Making our way back towards modern Walthamstow we view the house of famous artist and designer William Morris , a modernist town hall and the longest street market in London. The remains of a royal palace, a riverside promenade and some wonderful views of West London all feature on this walk which introduces you to one of London’s most attractive villages. Find out what has attracted residents past and present from kings to rock stars. GROUP TOURS (see right). These are PRIVATE tours that DO NOT take place on scheduled dates but can be booked for ANY DATES by group organisers at a mutually convenient date and time. Pricing depends on the size of the group. Call Diane with your choice, or any ideas for your group visits. NEW! BOOK ANY GROUP TOUR AND PAY WITH PAYPAL OR CREDIT CARD. 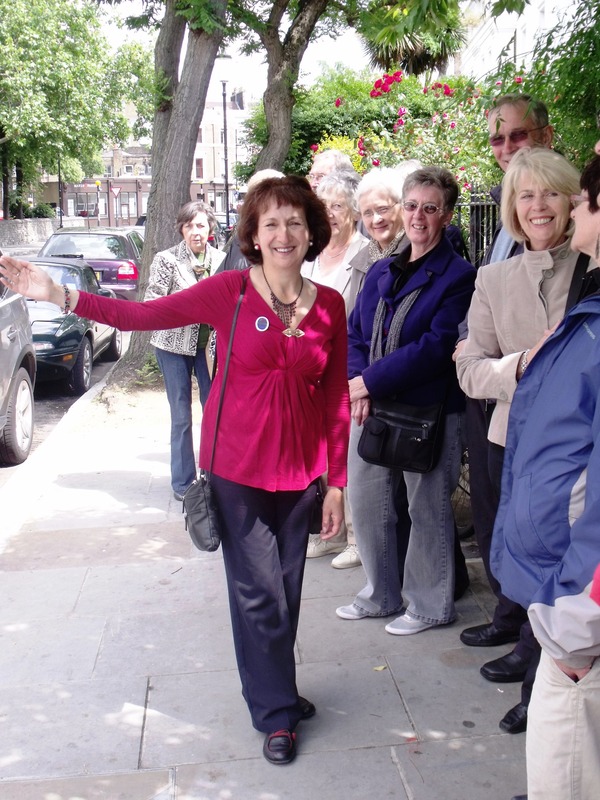 Secret London Walking Tour Leader, Diane Burstein, takes her group around Holland Park.